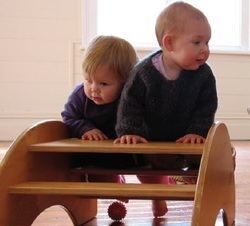 Playspace classes are ideally for toddlers between 1 & 2 years. Classes happen once a week for 10 weeks and are held in Paeroa, Thames, and Waihi. Toddlerhood brings with it fresh learnings about what partnership really is. It is a time when the young child’s push for autonomy very often outstrips the parents’ skills for partnership. During these classes you will be supported to learn more of the partnership skills which make up The Culture of Respect. During our parent-infant classes you established the partnership-dance with your baby by using the skill of respectful invitation. But your toddler is really bright, and it doesn’t take too long before she works out that she can turn your invitation down. Then what? Conflict is a normal and essential part of life. We will explore skills for managing our own conflict with our children, and for managing the conflict that arises between children. Toddlers unfold through play. We will learn to recognise their inbuilt patterns of play as they unfold, and how to support them for your toddler’s optimum development and learning. imagination, from colouring-in books to plastic (or wooden) food. We will explore how to protect your child’s imagination - and save yourself a lot of money.